The EP Analytical balance performs to specifi cation, all day, every day. And with features such as the unique hands free auto rotating draft shield, SCS self-calibration system and the intuitive user settable operation, the balance will handle any task you set for it. Executive Pro provides you with a comprehensive solution to demanding laboratory tasks and allows you to provide and capture critical results. 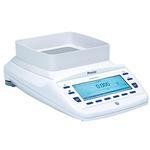 With the 360 series, Precisa is setting new standards in the demanding area of high-end laboratory balances: innovative, hightech instrumentation which includes the latest technical developments, unique performance features, best user-interface and the most modern design to establish the 360 series as the very bench-mark for modern laboratory technology. Those users who will not accept any compromise in their working environment may enjoy the reassuring certainty that for many years they can rely on an extremely accurate laboratory instrument which features the latest technology and renowned Swiss Quality. Day after day. With the 360 EP series balances, Precisa is setting new standards: innovative, high-tech instrumentation which includes the latest technical developments, unique performance features, best user-interface and the most modern design to establish the 360 EP series as the very bench-mark for modern laboratory technology. The 360 series owes its extremely high reliability and durability to the well-known competence of Precisa’s engineering and development. 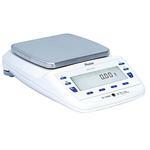 The weighing cell is of the highest mechanical quality, operates extremely precisely. The structured access to the balance menu and the clearly presented, easy to read graphic display offer simplicity of operation. Precisa’s new slide-in modules provide a range of connection options for the balance. The interchangeable inserts assure connection to future communication technologies like USB Host, Ethernet wired, Ethernet wireless, Bluetooth and RS 485. Impressive design - The modern, slim design by designer Paolo Fancelli gives our compact, integrated technology an impressive form and positions the new series visually in a class of its own. Expanded weighing range - Precisa balances distinguish themselves through their high weighing ranges, as yet unsurpassed in the market. Milligram resolution balances with weighing ranges of greater than two kilograms, or balances with a weighing range of eight kilograms and a readability of one hundredth of a gram. Intuitive user-interface - The structured access to the menu and the clearly presented, easy to read display offers simplicity of operation which until now has simply not been available. A few examples of the versatile control offered by the 360 series include the start-up display which can be personalised, freely selectable display options and softkeys for direct menu navigation. Furthermore, additional information can be zoomed onto the main display and the useful Language Tool makes it easy for the user to load his or her own language and characters onto the balance display. Highly precise technology - The 360 series owes its extremely high reliability and durability to the well-known competence of Precisa’s engineering and development and, as a result, exceeds all established industry standards. The weighing cell is of the highest mechanical quality, and operates extremely precisely; it can also be repaired easily and economically. Moreover, our fully automatic, programmable time and temperature controlled calibration system ensures absolute accuracy. Optimum measurement condition - The sensor driven electrical draftshield allows touchless operation and fastest high-precison measurements at a resolution of 0.01mg and 1mg. The free programmable sensor functions provide unlimited opportunities for optimization of workflow. Easy cleaning of draftshield understood. Versatile connectivity - Precisa’s new, advanced insert technologies, featuring the slide-in module, provide a range of connection options which until now have not been available. The interchangeable inserts assure connection to future communication technologies. Units g, mg, ozt, lb, tael, etc.